It is finally getting warmer here in Northeast Ohio, and this new warm weather means that there are more things to do outside. One of the nicest activities to do to appreciate nature and the new warmth is to see flowers for the (relatively) short time that they are around. And there is one place in the area that is especially famous for these flowers: Lakeview Cemetery. You might think that a cemetery would usually be a somber place, but this one is more serene than sad. 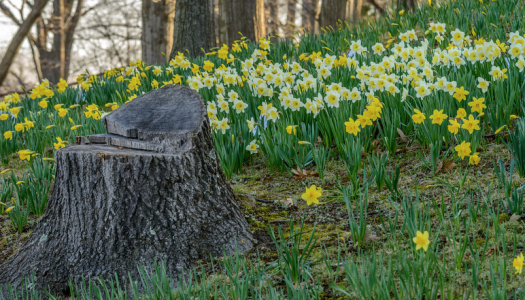 Especially around Mother’s Day every year, when an (appropriately named) “Daffodil Hill” in the park blooms with thousands of the bright flowers. It is a great place to visit if you are in need of a relaxing few hours. Historically, the cemetery was founded in 1869 and occupies about 285 acres. As well as the numerous flowers, one of the main focal points of the area is the James A. Garfield Memorial, which is the final resting place of the president himself. There is also the Wade Chapel, which is fairly small and has beautiful stained glass mosaics on the Tiffany windows. And the Rockefeller family, who was so prominent in Cleveland in the past, also has an obelisk in their namesake. The cemetery is open year-round, but if you want to see the daffodils, you should go soon, because those are obviously quite temporary. Lakeview is located on the East Side of Cleveland, just south of Little Italy. And, when you are going to be seeing such pretty sights, it is definitely worth taking this short drive!